This Physician’s Weekly feature on initiating insulin and strategies to overcome patient fears was completed in cooperation with the experts at the American Diabetes Association. Taking time to identify the reasons behind patient concerns can help physicians develop a strategy to initiating insulin. Determining the level of concern and asking open-ended questions about patient perceptions on insulin can help (Table 1). “We need to listen to patient responses to help us better understand why patients are apprehensive and then address the issues early,” adds Dr. Pettus. 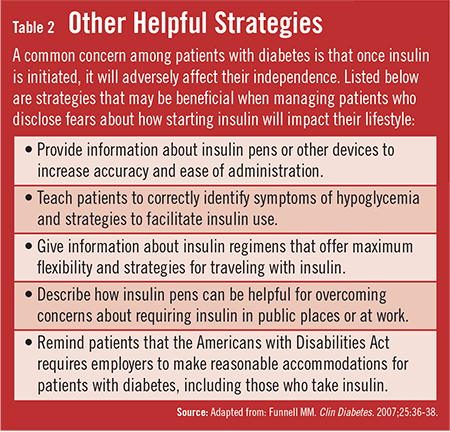 Several strategies have been effective when addressing patient barriers to starting insulin. “Throughout the course of care, it’s important to educate patients about their treatment options and the medications they’re taking,” says Dr. Pettus. “They should also understand that insulin will be required when non-insulin treatment options are no longer effective.” He recommends informing patients early that insulin may be needed to prepare them well in advance of this potential need. To address fears about painful injections, Dr. Pettus suggests that clinicians focus on telling patients about the advances that have been made with insulin needles. “The needles we use for insulin injections today are smaller and thinner than ever before,” he says (Table 2). “Taking some extra time to show patients that injections are painless can go a long way to alleviating fears.” Some reports suggest that most patients find insulin injections to be less painful than testing their blood sugar. Some patients with diabetes have heard about negative experiences with insulin through relatives or friends. As a result, they may believe that insulin actually causes complications or death. “We may need to do more than simply present the facts on insulin to overcome patients’ fears,” Dr. Pettus says. He recommends that clinicians think about providing anecdotal information from their own experiences with managing patients who were fearful of starting insulin. American Diabetes Association. Standards of Medical Care in Diabetes—2013. Diabetes Care. 2013;36:S1-S110. Funnell MM. Overcoming barriers to the initiation of insulin therapy. Clin Diabetes. 2007;25:36-38. Available at: http://clinical.diabetesjournals.org/content/25/1/36.full+html. Peyrot M, Rubin RR, Lauritzen T, et al, the International DAWN Advisory Panel. Resistance to insulin therapy among patients and provides: results of the cross-national Diabetes Attitudes, Wishes and Needs study. Diabetes Care. 2005;28:2673-2679. Nathan DM, Buse JB, Davidson MB, et al. Medical management of hyperglycemia in type 2 diabetes: a consensus algorithm for the initiation and adjustment of therapy: a consensus statement of the American Diabetes Association and the European Association for the Study of Diabetes. Diabetes Care. 2009;32:193-203. Kabadi UM. Starting insulin in type 2 diabetes: overcoming barriers to insulin therapy. Int J Diabetes Dev Ctries. 2008;28:65-68. Hunt LM, Valenzuela MA, Pugh JA. NIDDM patients’ fears and hopes about insulin therapy: the basis of patient reluctance. Diabetes Care. 1997;20:292-298. Jeremy Pettus, MD, has indicated to Physician’s Weekly that he has in the past worked as a consultant for sanofi-aventis and Janssen and has worked as a paid speaker for Johnson & Johnson.